Pfanstiehl is a leading current good manufacturing practice (cGMP) manufacturer of parenteral grade excipients and highly potent active pharmaceutical ingredients (API). Pfanstiehl develops and manufactures high-purity, low-endotoxin (HPLE) carbohydrates such as trehalose, sucrose, mannitol, galactose, maltose and mannose utilized as injectable excipients for the stabilization of proteins, mAbs and vaccines. These HPLEs are also used as supplements for industrial cell culture, cell therapy and cryopreservation media. Pfanstiehl works closely with many of the world’s largest multinational pharmaceutical and biopharmaceutical firms, as well as virtual pharmaceutical companies, to synthesize proprietary and commercial compounds in quantities ranging from grams to tonnes. Pfanstiehl has a 40-year history in custom synthesis, custom manufacturing and process scale-up development. The company is based near Chicago, Illinois, US. Whether you are working at an innovator company on a novel formulation or at a biosimilar firm trying to replicate an existing tried and true formulation, consider Pfanstiehl as your pure source for a plug and play solution. Pfanstiehl can provide custom synthesis of new chemical entities (NCE), specialty carbohydrates and injectable-quality, cGMP pharmaceutical ingredients in commercial quantities. Our capabilities include process scale-up, development and process validation, according to cGMP guidelines. 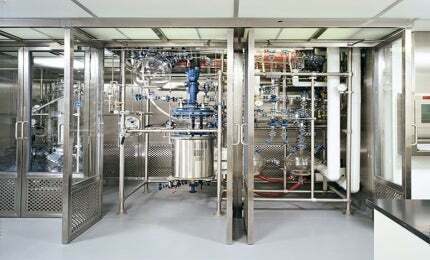 Our facilities and equipment are configured to produce HPLE compounds, including potent (highly active toxic or cytotoxic) drugs under cGMP conditions. As a long-time manufacturer of low-endotoxin carbohydrates, injectable grade excipients, active pharmaceutical ingredients (API) and pharmaceutical intermediates, Pfanstiehl can establish and maintain US and European drug master files (DMF) and European ‘Certificates of Suitability’ for your product. Pfanstiehl is here to help you get your compound to market, seamlessly bridging the critical gap between product development and regulatory approval. With over 40 years of cGMP manufacturing experience, Pfanstiehl has prepared the necessary documentation, validation and qualification systems to ensure compliance with the FDA and other regulatory bodies worldwide. Maintaining more than 15 DMFs for customers and for Pfanstiehl proprietary APIs, our services include cGMP manufacturing and cGMP-compliant process development and validation. Pfanstiehl’s facilities are FDA registered and inspected with over 15 active DMFs, which include US Type II, Canadian and European DMFs and Certificates of Suitability. Fully qualified equipment and utilities are used in the cGMP manufacturing areas, in addition to cGMP development and scale-up services. Experienced manufacturing, quality assurance and regulatory affairs teams are available to provide support and advice during the devlopment process. This whitepaper will provide an introduction to high-purity carbohydrates often used for applications such as stabilisation, modulation, and cryopreservation, comparing the old paradigm that formulation components are inactive ingredients with limited functionality with the new paradigm, which suggests these components play a significant role in therapeutic stability, quality, potency, immunogenicity, and bioavailability. Galactose is a monosaccharide sugar of the hexose class that is a constituent of lactose and many polysaccharides. Mannitol is classified as a sugar alcohol and is derived from a sugar (mannose) by reduction. Other widely known polyols are xylitol and sorbitol. Vice-president of research and development (R&D) Dr. Trevor Calkins discusses Pfanstiehl’s active pharmaceutical ingredients (API) contract development and manufacturing organisation (CDMO) philosophy and capabilities at the CPhI/InformEx exhibition in Philadelphia. Pfanstiehl offers a wide array of API development services at its campus just north of Chicago. The company has one of the first Safebridge-certified facilities in the world and is passionate about solving complex chemistry challenges. The company is focused on being in lockstep with clients from early preclinical through commercialisation. In the pharmaceutical industry, products that benefit from the stabilising effects of trehalose include, but are not limited to, monoclonal antibodies (mAbs), antibody drug conjugates (ADCs), fusion proteins, peptides, stem cells and vaccines. The increasing complexity of large molecule and cell-based therapeutics calls for an evolution in our understanding of the impurity and functional contributions of each formulation component. Four commonly utilized carbohydrates for ptotein stabilization are Sucrose, Trehalose, Mannitol, and Maltose. As Pfanstiehl approaches its 100th anniversary in 2019, the company has launched a new high-purity, low-endotoxin, and low-metal L-Arginine to meet US Pharmacopoeia (USP), European Pharmacopoeia (EP), Japan Pharmacopoeia (JP), and Chinese Pharmacopoeia (ChP) standards. As part of Pfanstiehl’s continual commitment to producing high-purity, low-endotoxin and low-metal (HPLE-LM) offerings for bioprocessing components, two new D-Galactose products were launched. Pfanstiehl will be attending PepTalk: the Protein Science Week from 19-23 January 2015 in San Diego. Pfanstiehl has announced the launch of a new high-purity, low-endotoxin, Mannitol, which is manufactured in the US under strict current good manufacturing practices (cGMP) and ICH Q7 compliant conditions. Pfanstiehl has announced the launch of cGMP-produced, high purity Mannose (USP/NF, EP), manufactured in the US under ICH Q7 compliant conditions. Pfanstiehl is aggressively investing in its potent API contract manufacturing capabilities at its US-based cGMP facility located north of Chicago, US. Pfanstiehl just announced the launch of its new high purity, low endotoxin, non-animal-derived Galactose (USP/NF, EP), manufactured in the US under strict cGMP, ICH Q7-compliant conditions.